Communion or CUMunion when the Bride and Bridegroom become one, by drinking His Blood (Wine) and eating His Body (Bread). Why is this slope or angle so important ? First, notice his small slope or ramp towards the Altar of Sacrifice. before HIM, represented by us in copying the ultimate. That's real Communion. 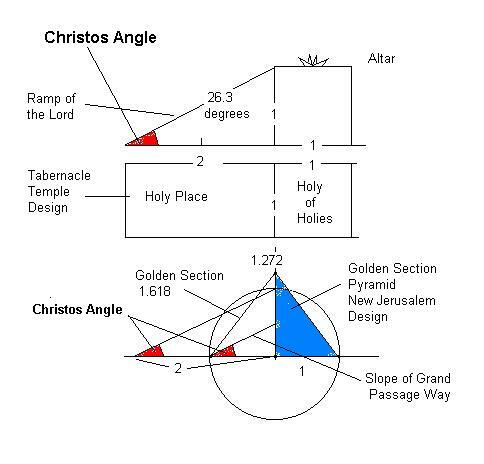 upward of exactly 26.3 degrees or a right angle triangle of base 2 and height of 1 so that it creates a Christos Angle to the Altar. have for Him, not in dying but so that we can live for HIM..Romans 12 etc.) be just like in the Original Tabernacle Design. know what I mean... so why not as we are the living sacrifice !!! it was done via His sacred design so why not again in compliance to the ORGINAL. As before so again, as above so below ! !